In the early days, getting in and out of Jackson Hole was not easy. To get needed supplies, those early residents had to travel to Pinedale or even further to Rock Springs. A favored route was to head up the Gros Ventre River, cross over to the Upper Green River then down to Pinedale and beyond. 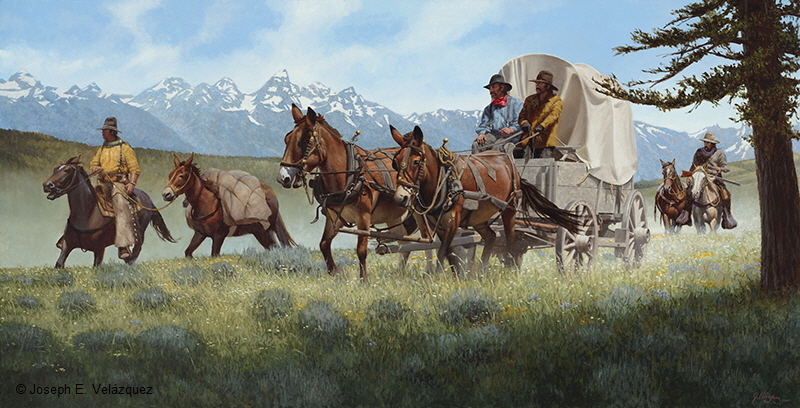 In this scene, a group of settlers is beginning their long journey. On the return trip, the wagon will creak under its heavy load of new provisions.